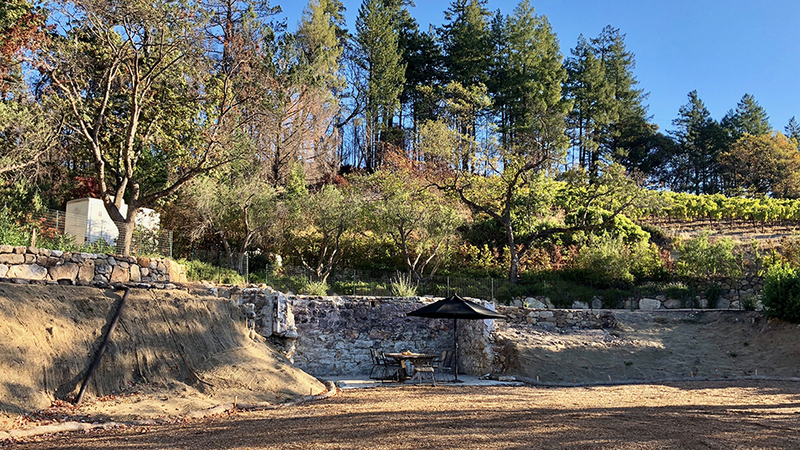 My most recent visit to Mayacamas was quite poignant as it was the first time I had visited the property since October 2017, when fires ravaged much of the property. Scorched hillsides are still visible, while the site of the old tasting room, which burned to the ground, is chilling. On a more positive note, this reference-point estate continues to make striking wines under its new ownership. In addition to a host of current and upcoming releases (covered in my forthcoming Napa Valley report) I also had a chance to revisit two Cabernets from the estate’s library. 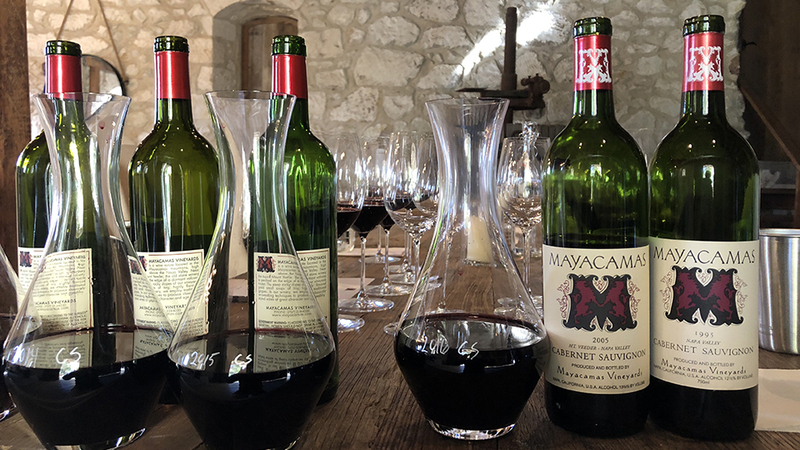 Readers who want to learn more about Mayacamas and its history might like to revisit this article from a few years back. The former tasting room at Mayacamas burned to the ground in the Nuns Canyon fire in October 2017. The alcove once housed a small collection of older wines, while the table sits more or less where it always did. The 2005 Cabernet Sauvignon is a gorgeous wine, but it also needs a good hour or more of air for some of the initial signs of funkiness to blow off. As that happens, the 2005 reveals a core of intense, concentrated dark fruit to match its brooding personality. Leather, smoke, licorice and tobacco all add to an impression of inward power, and yet in the glass, the 2005 opens up beautifully to show notable density and layers of texture that still need time to fully emerge. Although I have had better bottles, this is certainly a very fine example. Readers lucky enough to own the 2005 can look forward to several decades of exceptional drinking from this powerhouse, old school Napa Valley Cabernet Sauvignon. 96/Drink: 2018-2038. Silky, layered and nuanced, the 1995 Cabernet Sauvignon is hitting its full stride. More importantly, the 1995 shows all of the quirkiness that is such a signature of the Bob Travers-era wines here. The 1995 is gracious and beautifully persistent on the palate, but even those commendable qualities can’t mask a very perceptible element of brett. With age, brett can be an attractive strand in a wine’s fabric. That is very much the case here. In my view, though, the 1995 sits on the edge of where small imperfections are a distraction. Frankly, the 1995 could have and should have been a better wine. Even so, it is very pretty and highly expressive today, with hints of sweet pipe tobacco, crushed flowers and leather that extend the finish effortlessly. The 1995 is intriguing, but to be fully appreciated it requires a taster willing to look past some of its flaws. 93/Drink: 2018-2033.